Ginger Cottages Santa's Ski Lodge. Hand-crafted from wood in the USA in the Richmond VA area by artist Glenn A. Crider this cottage ornament is detailed inside and out with many secrets and details to discover. Specially designed to accommodate a standard mini bulb in the base from a display or tree, which when inserted illuminates the details inside. Coming ready to hang with a brown cord. 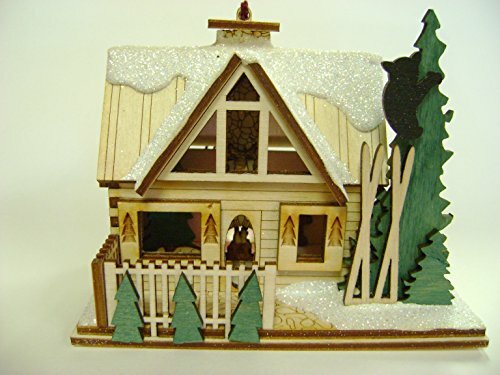 The Ginger Cottages Santa's Ski Lodge wooden ornament is sure to be a prized addition to any collection. There is a small hole in the bottom that allows a small light (not included) from a display or on a tree to be inserted and reveal the details inside. A beautiful gift that any Ski enthusiast would appreciate. If you have any questions about this product by Ginger Cottages, contact us by completing and submitting the form below. If you are looking for a specif part number, please include it with your message.